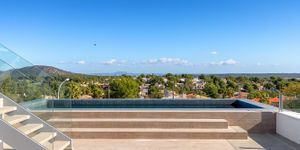 This exclusive modern high quality villa with a southeast orientation is situated in an elevated position and offers stunning panoramic sea views. 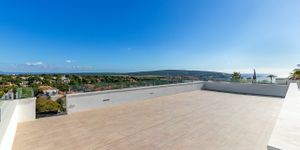 The property consists of 2 levels plus chill out roof terrace and a basement. Living-dining area with kitchen are at the top. 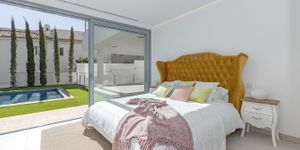 The three bedrooms with en suite bathrooms are on the ground floor with the pool terrace. The basement offers a garage for 2 cars, a guest area, as well as an office. The beautiful outdoor area with pool terrace, and various open and covered terraces invites to relax.